The catamaran is the first application of torques because its geometry makes estimates relatively simple. A typical catamaran sailboat has two narrow canoe-like hulls that are separated by about half a boat length. The mast is centered in a structure rigidly connecting the two hulls. 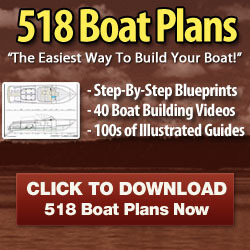 Over the ages, variations of the catamaran have been invented many times and in many places. The word "catamaran" [kattumaran = tied logs] comes from the Indian Tamil language. Polynesians colonized much of the Pacific in catamaran-like doubled canoes. Normally, catamarans don't tip much, unless they tip over. 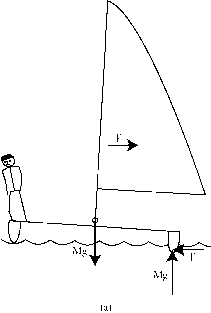 The forces jeopardizing a catamaran on the edge of stability for roll are shown in Figure 4.2. For the boat in (a), the left hull is about to leave the water. Any increase in sail force produces the tipping shown in (b). The negative sign applies because this torque rotates clockwise. The negative sign indicates another clockwise torque. 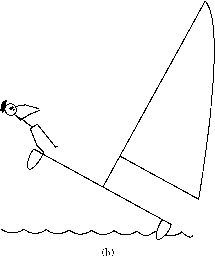 Figure 4.2 (a) A sailboat stays balanced when the sum of the applied torques vanish. (b) When the torque from the wind and water exceeds the compensating torque supplied by buoyancy, capsize results. The positive sign means the buoyancy torque is counterclockwise. The boat will be stable only if the sum of the three torques vanishes. Setting the sum of torques equal to zero yields a maximum value for the force of the wind. A wind force any larger than F(max) will tip the boat over. Equation 4.7 makes intuitive sense. In order to withstand a larger wind force, the catamaran should be wider (larger B) or heavier (larger M). If the mast is taller (larger h1) or the water force is applied to a deep board (larger h2), the F(max) will be smaller. Rough estimates of the forces and wind speeds are given here for a catamaran with properties similar to a Hobie-17 (see Figure 4.9), L = 5.2 m, B = 2.3 m, and M = 143 kg. The mast is about 8.2 m high, so h1 + h2 = 3 m is a reasonable rough approximation, which yields F(max) = 540 N. Any greater wind force would capsize the boat.